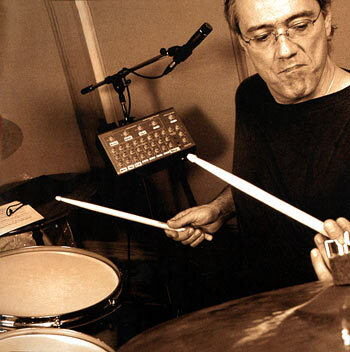 Graduated from the prestigious Berklee College of Music in Boston, Vinnie Colaiuta becomes at 22 years old, the Frank Zappa drummer, succeeding the great Terry Bozzio, from 1978 until 1981 ("Shut up and play yer guitar" a monstrous album!) and will be soon asked by many artists (such as Joni Mitchell, Barbra Streisand and especially Sting in 1993 ("Ten Summoner's Tales", "Mercury Falling" (1996), succeeding Stewart Copeland, Omar Hakim and Manu Katché!) as studio musician. He will also play with the best contemporary jazz musicians such as Chick Corea, Herbie Hancock, Bill Evans or John Patitucci, for example. Vinnie is a drummer with rarely equaled technique (heel-toe with both feet in independence, 3 limbs rolls with passages within the doubled notes, alternating strokes, etc. 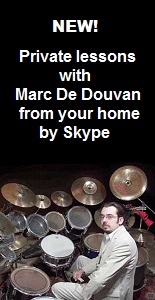 ), with complex playing (master of improvisation in asymmetric measures, breaks beats, ghost notes, improvisation of the 4 limbs in independence at the same time, in the vein of Jack DeJohnette), versatile and powerful, like the great contemporary drummers like Dennis Chambers, Dave Weckl, Terry Bozzio and Billy Cobham, to name a few. He had the honor to play in an improvised "drum battle" trio with nothing less than Dave Weckl and Steve Gadd at the first tribute concert to Buddy Rich, reserved for the greatest drummers of the time (1989).